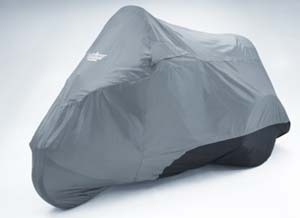 FC-466BC: With many of today’s trikes getting longer and wider, We now offer an extra-large trike cover for those rides. 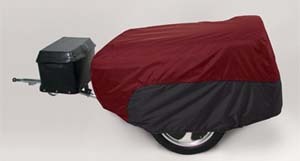 The new XL Trike Cover was made to fit the larger GL1800 trikes as made by Hannigan, Roadsmith and California SideCar Trikes. This cover has been custom designed to provide the same tailored fit our Covers are known for. Available in Black over Charcoal with polyurethane coated polyester for maximum durability and light weight compactness. 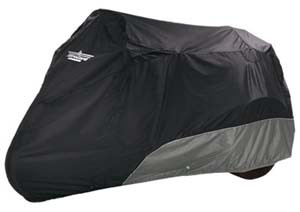 Easily fold back up to fit into their small compact pouch for fitting in your trunk, saddlebag or lid covers. 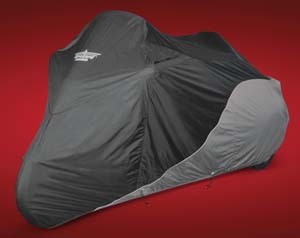 The Classic Series line of covers offers exceptional value without compromising the features you have come to expect. Available in three color combinations: Cranberry over Black, Black over Charcoal and Charcoal over Black. *Also cover Electra Glide with Voyager trike conversion. 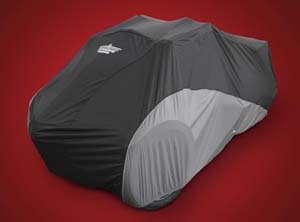 FC-365: Economical Trike Cover. Similar to above but without a heat shield. 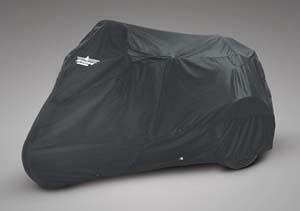 FC-476BC: With the Can-Am F3 being an all new Spyder, we have an all new cover designed just for it. As is typical with these covers, the seams are interlocked and double stitched so they will not pull apart. 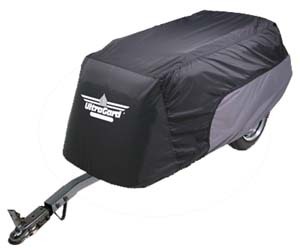 Made from durable polyurethane coatedpolyester for excellent weather resistance, this new cover is stylishly designed in black over charcoal with high visibility reflective piping allowing your ride to be seen at night and in the parking lot to avoid being hit. Includes two rust proof grommets with 10’’ bungee and coated hooks to allow the elastic hem to be securely fastened for a snug fit. An expandable zippered windshield pocket and zippered backrest pocket allows proper fitment for F3 Spyders with or without awindshield or backrest. 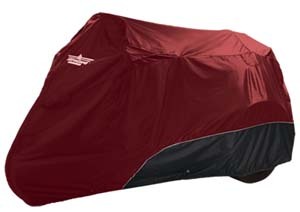 A lined heat shield protects the cover from hot mufflers and added liner pads protect from wear at the mirrors, handlebars and tail lights where extra wear can occur. A handy zippered storage pouch allows easy repacking intoa compact size for on Spyder storage. 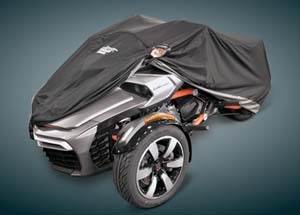 Black over Charcoal, for Can-Am Spyder F3 series. 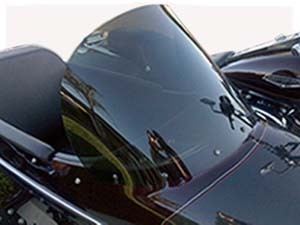 WS-SC: Harley Davidson Side Cars 1991-Up Motorcycle Windshield. Finally a shield that's available in a height you've been looking for. No need to purchase the separate gasket because the gasket is included in the shield price. All holes are pre-drilled for a fast installation and polished to a brilliant luster for years of service Our shields feature polished edges for a glass like appearance with quality that's second to none. Available in six different sizes and made in the USA. Specifications: Stock Size 19" TLE & RLE. Fits all models: TLE & RLE Sidecars 1991 & UP measured from center hole to the top center of the shield. Manufactured from .150 aircraft grade acrylic and available in clear, opaque black, light/dark gray tints.